I was overjoyed to find your site. I have been searching the web for about two weeks trying to estimate the dates for four very unusual items. I think I was correct in assuming that they were SE Asian/Chinese, from your article on Martaban jars. I am attaching a couple of photos. I have more pictures with close-ups of bottoms, etc and can describe them further, but all these files are 200-300k and I don't want to clog up your server, so I am attaching a group shot and one shot of the most puzzling pot-these were brought up in fishermen's nets in four separate tows some years ago, off the Northern California coast. The small round one [D] is cream-colored body, very musical high-fire "ping", very shiny brown glaze and probably thrown. 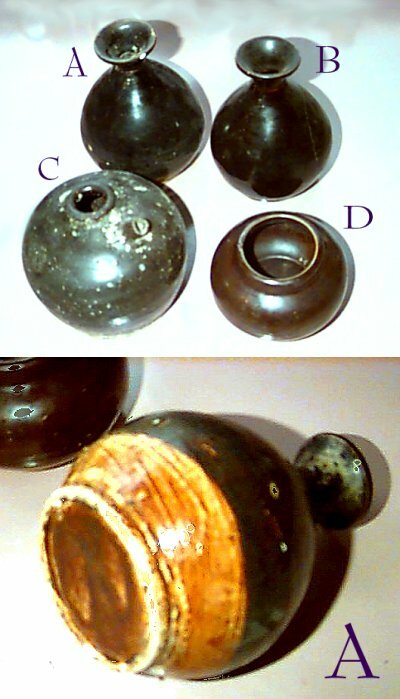 The two necked bottle/vessels [A & B] are quite different from each other- both appear to be coil-built, both brown glaze but of different types; the dullest one [A] has a dull "ping', grayish body with recessed bottom. The glaze is dulled and is dark brown over a yellow [lead?] glaze that doesn't reach the bottom on the body of the piece. The bottoms of both pieces are glazed, however. The shiny necked vessel [B] has two types of brown glaze- chocolate over the top, with another layer showing at the bottom that appears iridescent - this was hard to get on film. The spouted vessel [C] also has a dulled brown glaze, no glaze on the bottom, and appears to be made of a gray clay body with a dull "ping", like low-fired pottery. It also appears to be coil-built. There are no cracks or chips to these pieces, other than a rim chip on [A] that is visible. They were brought up from very deep water. That they survived the nets is, I think, miraculous. All are relatively small pieces, no marks, other than scrapes on the bottom made during production. I am sure they are completely "genuine". They still have traces of barnacles,etc. Their origin came up in a casual conversation because of questioning on my part when I saw them. The fisherman's attitude was that they represented an annoyance that had snagged his nets, and were a souvenir of an exasperating season - he wasn't happy about having more pots than fish! I personally would have fished for more pots, but that's a matter of focus. Anyway, I volunteered to find out what these items really were, since they had no idea. Are these SE Asian examples or Chinese? They are not very large. Do Martaban jars come in smaller sizes? What else should I be looking for, and what other characteristics would help me date these? The yellow glazed [A] has me stumped as to date and origin. Also - what effect does submersion in saltwater have on the characteristics of earthenware and porcelain and their glazes? Is dulling a uniform sign of greater age? Or is it a chemical reaction that would help identify the type of glaze and therefore origin? That's probably a lot of questions, but, as you can see, I am fascinated by these little pots. Thanks very much. Any and all comments are bound to be helpful. First of all I would like to confirm that these pieces are Chinese in origin and most probably made at one or several local kilns along the South Chinese coast, probably from the Canton area but possibly also slightly more to the Northwest - i.e. the Fujian province. The differences in sound when struck are not significant since this could be caused by different kiln fire temperatures even during the same firing in the same kiln, or secondary - caused by the submerging in sea water, for at least more then 100 years. If I had not personally been familiar with exactly the type of vases you have indexed as "A" I would probably have suggested a Song or Yuan dynasty (10th-11th century) date for these items, upsetting just about what we have in the world of marine archaeologist and experts on early trade routes. Now, I happen to have one vase exactly like this in my reference collection, and have for exactly the same reason that caught your interest, been discussing it at length with other collectors. What came out of these discussion was that the vase is probably made as a Song dynasty copy, basically because there are no other reason for the light brown dressing on the bottom part of the vase, then actually making it look like it was made of a darker paste - i.e. copying another ware. There is also more work put down on the base then would be natural if one were not paying some "extra" attention to its appearance. The dark paste and the black glaze in itself are further typical for Chinese wares made along the South Chinese coast and would nicely fit in at those locations. It is still though an open question exactly when these pieces were made but since these items actually was found off the Northern California coast I find it very likely the presence of these pieces somehow connects with the Chinese immigrants arriving at the time of the Gold rushes and railroad works being made there by the end of the 19th century. From this date it would also be possibly that what snagged your fisherman's nets and what he thus have found is actually a wreck which should be possibly to identify by taking a look in old official papers from this period, not spanning more then a few decades. Regarding the other pieces it would be seriously interesting to study them too since their characteristics - specifically shape and bases - would be quite interesting to have, since I believe that they most probably belong to the same ship's cargo and thus should be contemporary. As a final comment on your question on "Martabans" or "talking jars". They were very rarely made of anything similar to the porcelain paste in these pieces and need not to be considered in this context. I can clearly see what you are thinking of, but "Martabans" are by definition very large vessels, so by this reason alone they do not need to be considered together with your pieces, even if the Chinese coastal kilns could be the same or at least closely related.